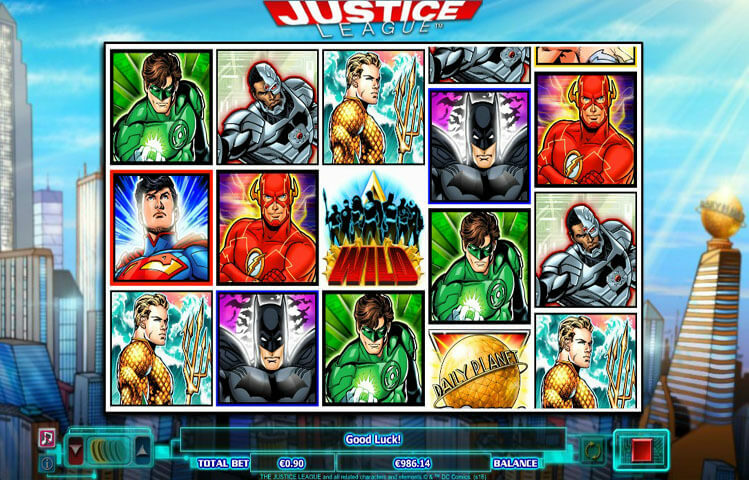 Justice League is the newest game by Next Gen Gaming that takes players on a great ride into the world of DC Comics. They will get to join some of the biggest heroes from that world. They will join the members of the Justice League as they try to protect earth from the villains who are trying to destroy earth and control the universe. So players better be ready for an action packed experience that comes with a lot of winning chances and bonus features. Justice League is a Next Gen Gaming powered game that is fun and exciting. The game has a lot to offer to players in terms of payouts and features. The game takes players deep into the world of the DC Comics as they join the biggest superheroes from that world. They will join Superman, Batman, Wonder Woman and the rest of the League as they protect the world from the evil masterminds who are seeking to control it. Players will see the control panel of the game underneath the reels where they will find the different buttons through which they can control the game. This includes placing the bets, spinning the reels, viewing the paytable and more. Since the game takes players to the world of the DC Comics with the Justice League, players will see all of their favorite superheroes appearing as symbols across the reels. This includes Superman, Wonder Woman, Batman, The Flash, Cyborg, and the Green Lantern. They will also notice that the 5 reels of the game are located in Metropolis, which is one of the cities from the DC Comics Universe. All of the visuals, the symbols and the overall graphic quality of the game are top notch. This is something to be expected from a game that is from the portfolio of Next Gen Gaming. Even the sound effects that players will hear during the game play are epic, and will help immerse players into the game’s action theme. The game has many special features. They start with the Wild Icon. This wild can land on reels 2, 3 and 4. The wild can replace all other icons, except the scatter and the bonus. It will replace the symbol that is going to trigger the biggest payout. There is also the Super Hero Rescue feature that can turn any icons on the three middle reels wild, at random, during any spin. There is also the Super Hero Power Up game. This round can be active when the same superhero lands and covers the entire 1st reel, with one of the symbols of that hero being a part of a winning combo. The 5th reel will be a duplicate of the 1st one, a re-spin will be given and all wilds and that superhero will be frozen. Lastly, there is a free spins round that gives players 10 free games when at least 3 bonus icons appear on the reels.